your permanent teeth for life. "WHERE YOUR SMILE IS OUR PASSION"
At Dentistry In Bolton, we provide ourselves in providing a high level of comprehensive, family dental care in a relaxing, comfortable and modern atmosphere. We are a family and a health-oriented team of professionals dedicated to serving patients of all ages, from young children to mature adults. We place an emphasis on patient education and customer service in order for our patients to make positive and well-informed choices for long-term dental health. With a proactive and welcoming approach to dentistry, we encourage our patients to become more enthusiastic in maintaining their oral health. We believe that the foundation for oral health is based upon patient education and a healthy dentist-patient partnership encompassing mutual trust, respect, understanding, and support. We take the time to thoroughly explain dental health issues and treatment options before treatment begins. At Dentistry in Bolton, our friendly, caring, courteous and experienced dental professionals will explain your treatment options in detail, as well as what you may expect before, during and after treatment. We are committed to supporting your oral health as well as helping you achieve an aesthetically flattering smile. We always strive to improve our technical skills and upgrade our technologies. 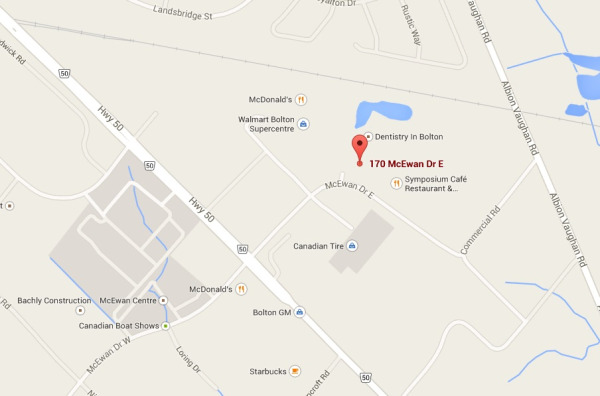 Dentistry in Bolton is proud to be serving the Bolton, Caledon, Orangeville and the many surrounding areas of Toronto. Our multilingual team speaks several languages: English, French, Greek, Italian, Spanish, Portuguese, Ukranian, Russian, Czech. We are currently accepting new patients and we offer evening and weekend appointments for your convenience!! proud sponsor of a Caledon Hawks Hockey Team. Dentistry in Bolton gives back to the community with several donations to local charities!